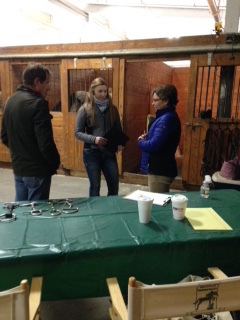 -Riders take a written test on Friday night with questions that range from horse care to class specs to current events in the horse world. -The riders with the top 12 scores in the test take part in a hands-on "Practicum" on Saturday. They are given a score out of 100. -Riders' scores from the New England Medal class are averaged with the other two scores to produce a final score and an overall winner. Usually, I sit in my little judge's booth and don't interact with the competitors I'm judging. This was such a welcome change! I got to actually interact with the kids doing the practicum and get a better sense of some of the juniors on the show circuit. I worked with Kate beforehand to coordinate questions. In the past, judges have asked riders to evaluate conformation, demonstrate wrapping or braiding, identify bits or grain, or put together a bridle. I feel like one of the most important things I see as missing from junior riders at horse shows these days is being involved in prepping the horses for the ring. Too often, I hear of riders who show up just before their class to a perfectly prepared horse, having no idea of what it took to get their horse ready. When I rode in the equitation, I prepared my own horse. Sure, I consulted with my trainer at times to figure out what my horse needed but I also just knew from taking him off the trailer or out of his stall on a show day whether he might need a few minutes on the lunge-line to get some bucks out, or an extra class. Do any riders today know how to prepare a horse for the ring, and do it themselves? I wanted to know! So I gave the riders a scenario and asked them to tell us what they would do to prepare. You have a seven year-old equitation horse that’s been doing the equitation for a year. It’s May and you’ve been training all winter in the Northeast. You are at one of your first shows of the year and your horse will probably be fresh. You will be doing the New England Medal at 3:00 pm. You arrive at the show at 7:00 am. The ring is all-weather footing and the weather is sunny and in the low 70s. Look at the schedule for the day (below) and when you come in to the session, be ready to talk through how you would go about preparing your horse in order to have him ready for the New England Medal. The riders in the practicum knew the types of things you would do to prepare a horse, i.e., lunge, ride in the ring, ride around the show, have a lesson, enter an extra class or two. They had ideas about what types of bits you might use for these differing activities and what tack you might use to lunge, and what classes you might enter. Dr. Kate Chope & Larissa Laffey as we await our next contestant. But, too often their plan involved ALL of the above. It felt like the "kitchen sink" answer, not the answer of a rider who actually prepared her horse for the ring. They said they would ride the horse around the show and in the ring in the morning. Or have their trainer ride the horse--yes, some kids said this (although slightly disturbing at least they were being truthful). They also cited lunging the horse and showing in extra classes before the actual class they were aiming for. All in one day! That seemed like a lot for one horse! I wished kids would have picked one approach and then said something like, "if the class didn't go as well as I would have liked, I think next show I would lunge him first." I think they were just trying to demonstrate their knowledge so I didn't want to fault them too much but I still would have preferred a more targeted answer. Not every plan for preparation works--I would have liked that they would make a plan and then adjust for the next show. I did appreciate that several riders mentioned hand-walking the horse around the grounds to get them used to the show. I felt that those riders showed that they are actually a part of their horse's preparation. After explaining their approach, riders moved on to putting a bridle on the horse that was kindly leant to us for the practicum. We soon saw a disturbing trend... too many riders couldn't get the bit in the horse's mouth! Instead of using their thumb to open the horse's mouth, they just clanked the bit against the horse's teeth, hoping he knew the drill. Thankfully, our practice horse didn't oblige. Other riders didn't know how to hold up the noseband or hold the horse's nose correctly. Riders then had to adjust the bridle. Several knew the benchmarks for correctly fitting a bridle but it felt more like they had read it in a book, not done it a million times themselves. Lastly, Kate asked some signs of a soft tissue injury and of colic. The best answers included riders talking about their own experiences with these issues--not just presenting book knowledge. If a rider shared personal anecdotes along with the facts, it was clear they had spent hours each day at the barn and not just in the saddle. In the end, we did have three riders scoring in the 90s. 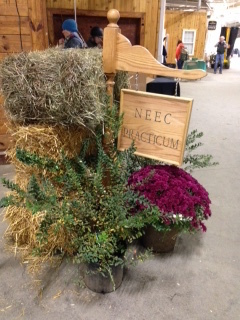 The winner of the practicum section stood out, especially because she noticed things about the horse in the stall and when she was putting on the bridle. She talked about checking his water to see how much he'd drank, seeing if he'd manured, and other details she noticed about him while she was tacking him up. It was impressive and indicative of someone who actually takes care of their own horse. We also had a few riders who scored solidly in the 80s and would have scored a lot higher, except for a few holes or mistakes in their performance. Some of these felt like the riding equivalent of picking up the wrong lead when you enter the ring--sometimes luck just doesn't go your way that day and you make a careless mistake that means your performance in that one class isn't indicative of your overall skill level. I noticed in the results that the top three overall were from one barn. That barn is clearly doing something right in the way they are training their kids not just in the ring, but in the barn too. Sadly, I heard from people at the show that many kids who are competing in the Medal Final don't even take the test. I'm not certain exactly why this is. Perhaps they're not good test takers, have a learning difference, and/or don't want to have to do what seems like "school work" in their off-school hours. I can appreciate those issues. But I wonder if some kids who would excel in the class aren't even entering for some reason? And I certainly wish the majority of kids would want to enter this special class. In the end, all I know is that this class is one of a kind in the hunter/jumper world and I wish there were more of them. I hope the kids who placed feel as good about their ribbon in the horsemanship as they would about getting a ribbon in the New England Medal Final. Riding is only one part of the sport. 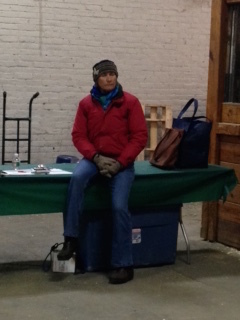 Kim Ablon Whitney is an R judge in hunters, equitation, and jumpers. Her latest novel set on the show circuit is Winter Circuit.